Home » News » Almeda’s Charity of the Year! LinkAge Network are delighted to have been chosen as Almeda’s charity of the year for 2019. 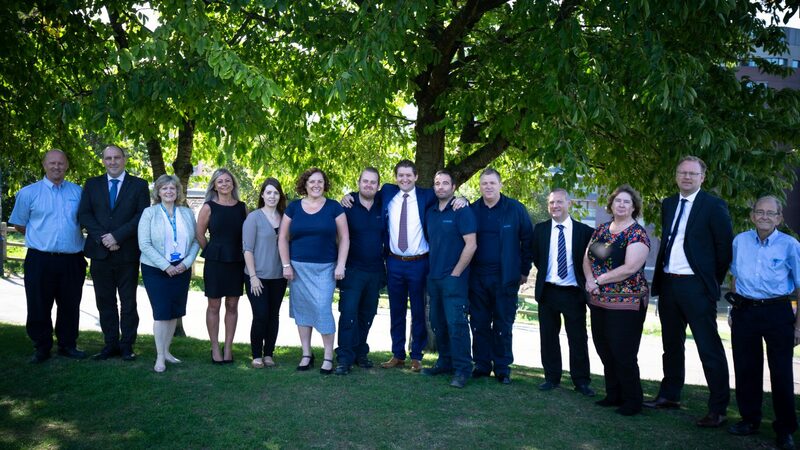 With their roots, and their hearts, firmly in the South West and particularly Bristol, Almeda’s workforce took a vote earlier this year to decide which charity they wanted the company to support in 2019. Four charities were proposed and LinkAge Network, and another Bristol based charity, received the most votes. With many Almeda staff having elderly parents who live locally, the work of LinkAge Network really struck a chord, and so Almeda were delighted to be able to provide their support to such a great cause. They kick off this support when three members of staff will fly the LinkAge Network flag at the Bristol 10k in May, running in the LinkAge Network Team alongside seven members of staff from Bristol Energy. Almeda’s Brady George, Managing Director and well known local business man, will be spearheading the Almeda Team alongside Sophia Gould, Contracts Manager, and Financial Controller, Ian Moorcroft. Brady’s appreciate of the work of LinkAge Network is genuine as he explains, “Generations of my family are proud of being Bristol born and bred and my grandparents, hard working south Bristolians, are some of the lucky ones. They’ve got our family around them and a support network that will always look after them – but just imagine if they didn’t and suffered not only financial hardship but emotional hardship too? We need charities like LinkAge Network to not only provide practical support but also to ensure that our old folks don’t go days and weeks without a friendly word from somebody who cares”. He added, “I’m delighted that my staff picked LinkAge Network and I’m looking forward to seeing how we can help them over the coming 12 months”. Wanting to keep up to date with Almeda and Bristol Energy’s team of runners for the Bristol 10k? Click here.